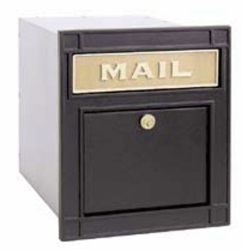 U.S. Mail Supply offers secure, lockable indoor and outdoor mailboxes for apartments, condos, homes, classrooms and businesses throughout the United States. Featuring steel & aluminum construction with recess wall mounted or pedestal mount options, we’ve got the inventory to offer you exactly what you need – with quick shipping to locations throughout South Carolina. Shop front and rear loading horizontal mailboxes and outdoor pedestal mailboxes for apartments, offices, condos and multi-tenant buildings. Available options include vintage style traditional apartment mailboxes or standard indoor horizontal locking mail boxes. All highly customizable. We’ve got USPS approved 4C horizontal mailboxes and 4C pedestal mailboxes for private delivery for sale online to South Carolina residents. 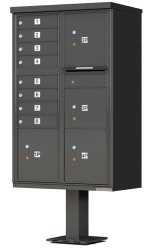 Featuring heavy duty construction and easy installation (wall mounted or pedestal), 4C mailboxes stand as an excellent long-term solution with a high security rating. The U.S. Postal Service will only deliver to mailboxes with USPS approval. Restrictions include required box sizes, locations, mail slot dimensions & identification information. Shop modern USPS approved mailboxes and skip the hassle of getting approval from the USPS. Shop all sorts of different options for high end, luxury mailboxes for apartments and multi-unit residences. 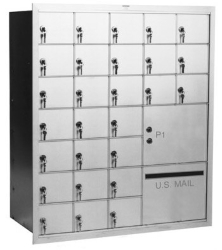 Choose from large mailboxe clusters or indoor horizontal mailboxes for a lobby area or walkway. Many can be customized with a slot for packages or outgoing mail. 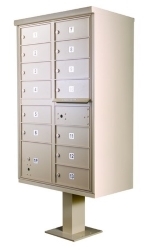 We’ve got a ton of options for outdoor mailboxes, including locking residential letter lockers (with post attachment) or Victorian style mailboxes for luxury apartment complexes. USPS approved and private use options available. 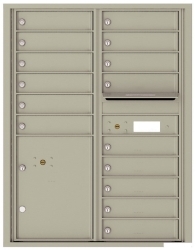 Shop horizontal and vertical surface mounted or recess wall mounted locking mailboxes. Front loading and rear loading options available. Get a secure, heavy-duty mailbox you can rely on for years to come. Need a residential mailbox that will last? Going cheap and replacing your mailbox once every couple years is a headache. Durable, long-lasting residential mailboxes from U.S. Mail Supply offer you a permanent mailbox option to give you peace- of-mind. 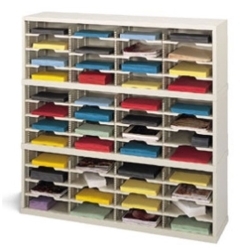 U.S. Mail Supply offers open and closed back mail sorters (vertical & horizontal) that do double duty as literature organizers for mailrooms, offices, classrooms or other businesses. HIPAA-compliant security mail sorters offer extra protection for hospitals & clinics. Skip the cheap option and get durable mailboxes you can count on for years to come. 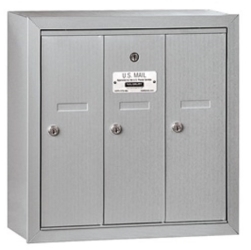 U.S. Mail Supply's inventory of commercial & residential mailboxes are built with steel and aluminum, offering a truly durable and long-lasting option that won't wear down in 5 years and have you shopping again. 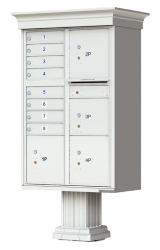 From large multi-tenant pedestal mount mailboxes to small interior locking horizontal mail boxes, U.S. Mail Supply has the solution. Choose between USPS approved or private delivery, front or rear loading, mount type, required dimensions and some details about the area you’ll be installing mailboxes. We’ll get back to you with an illustration of how your installed mailboxes will look and a price quote.